Imagine you and your favorite travel partner dangling in your own private little gondola, gliding silently for 40 minutes as you cross the Mer de Glace — the "sea of ice." On your right is the pillowy summit of Mont Blanc — Europe's tallest mountain. On your left are jagged rocks called dents (teeth) — each famous among the world's best rock climbers. You're near where Switzerland, Italy and France come together to "high five" the sky. Miles (literally) above Chamonix, you're riding Europe's highest lift. Your Alpine adventure starts in the touristy French town of Chamonix. From there, Europe's ultimate mountain lift, the Aiguille du Midi, zips you by cable car to the dizzy 12,600-foot-high tip of a rock needle. This lift is Europe's highest and most spectacular. The cost is about $65 round-trip from Chamonix (you can avoid the notoriously long lines by making an advance reservation). If the weather is good, forget your budget. Afternoons are most likely clouded and crowded. Ride up as early as you can to avoid miserable delays, especially in August. If you plan to dillydally, ride directly to your farthest point and linger on your return. The modern gondola is big enough for dozens of people. With its scratched-up interior, you can imagine it filled with stylish European skiers. But today, it's full of families — mom's rubbing suntan lotion on cherubic cheeks, kids tote pint-sized rucksacks, and ruddy seniors laced into their ancient boots grip trusty walking sticks. Chamonix shrinks as trees fly by, soon replaced by whizzing rocks, ice, and snow, until you reach the top. Up there, even sunshine is cold. As you step out of the cable car, it's immediately apparent that you're high in the sky. Bring some water, and give yourself a few minutes to acclimate. Fun things can happen on top if you're not too winded to join in the goofiness that takes over when everyone around you is a little short on oxygen. From the viewpoint, the Alps spread out before you. In the distance is the bent little Matterhorn (called "Cervin" in French). You can almost reach out and pat the head of Mont Blanc, at 15,771 feet, the Alps' highest point. Telescopes let you spot mountain climbers; more than 2,000 scales this mountain each year. To both save a little money and enjoy a hike, you can buy a spécial randonée ticket, which gets you to the top of the Aiguille du Midi, but only halfway back down. This gives you a chance to look down at the Alps and over at the summit of Mont Blanc from that lofty lookout. Then, you descend on the lift only to the halfway point (Plan de l'Aiguille), from where you're free to frolic in the glaciers and hike to Mer de Glace. From there you can catch a train at Montenvers back to your starting point, Chamonix. 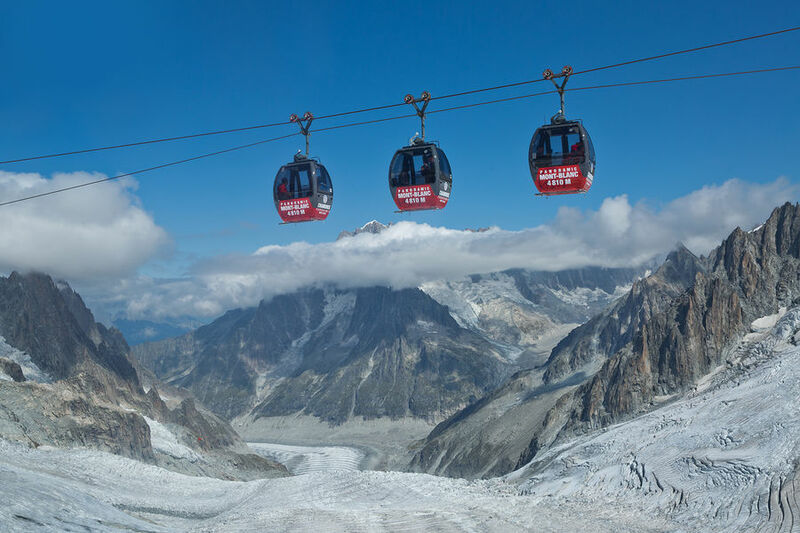 But for the ultimate Alpine joyride, grab a private gondola at Aiguille du Midi and continue on to Italy for what must be Europe's most breathtaking border crossing. In the tiny red gondola, you venture south. Open the window. Explore every corner of your view. You're sailing a new sea...on a line that stretches three miles with no solid pylon. (It's propped by a "suspended pylon," a line stretched between two peaks 1,300 feet apart.) Cross into Italy at Helbronner Point (11,371 feet) and descend on another lift into the remote Italian Valle d'Aosta. 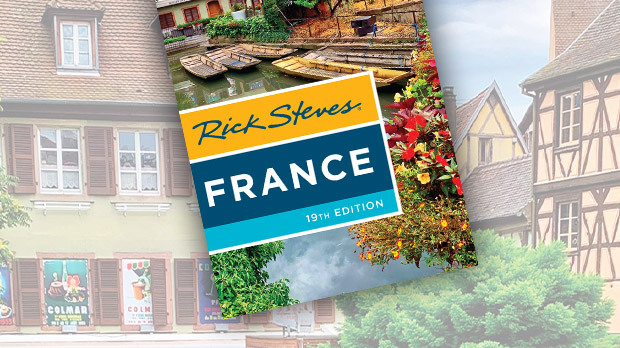 It's a whole different world — where a dash of France and a splash of Switzerland blend with the already rich Italian flavor and countless castles to give you an easy-to-like taste of Italy. The town of Aosta, your best valley home base, is a two-hour bus ride from the base of the lift in La Palud. If a fellow cable-car passenger has a car parked in La Palud, charm a ride to Aosta (buses from La Palud to Aosta only run a few times a day). "The Rome of the Alps," as Aosta is called, has many Roman ruins and offers a great introduction to the fine points of Italian life: cappuccino, gelato, and an obligatory evening stroll. An evening here is a fine way to ease into la dolce vita. If you don't go on to Italy, you can return from Helbronner Point back to Chamonix (possibly via the hike from the Plan de l'Aiguille). The resort town, a convenient train ride from Paris or Nice, is packed in August but surprisingly easy and affordable the rest of the year. Like Switzerland's Interlaken, Chamonix is a launch pad for mountain worshippers. The town has an efficient tourist information center and plenty of affordable accommodations. From Chamonix, you're within easy reach of days of more hikes and cable-car rides. The best hikes are actually opposite the staggering Aiguille du Midi, on the Gran Balcon Sud. This is a high-altitude world of pristine lakes, great Mont Blanc range views, and hang-gliders lunging off the cliff from the Brévent lift station. Watching these daredevils fill the valley like spaced-out butterflies is a thrilling spectator sport. Probably the best hike — two hours each way — is from the top of the Flégère lift to Lac Blanc. While demanding, the trail is well signed and the views are breathtaking. If you like the Alps, you'll love Chamonix, where hikers and non-hikers alike can enjoy vast mountain vistas with little effort.